Certain species native to the Pacific Northwest will grow new plants from cut sections of branches planted into moist soil. We find that willows and black cottonwood generally have the highest success rates. Cuttings are relatively inexpensive and simple to install-under the right conditions, they are easy and economical to plant. Cuttings root most readily if they are cut and planted in late fall through early spring, when dormant. Live stakes, brush, and fascines are highly perishable and must be stored in shaded, cool, moist conditions before planting. They should be covered in burlap and thoroughly wetted daily. We recommend storing them in this manner for no longer than two weeks. Sticks stored for longer may have lower success. Live stakes are sections of branches without twigs or leaves that may be pounded directly into very soft soil. Pilot holes must be made in harder soils. For installation by hand, we recommend stakes ¾-1½ inches diameter (over the entire length) and 2 to 5 feet long, depending on the application. Photo above. 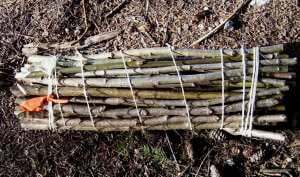 Fascines are bundles of brush material or stakes tied with twine that are planted across a slope in shallow trenches. Fascines are generally 4-8 inches thick and 6-12 feet long. Our information sheet, Fascine installation, has more information on how and why to use fascines. Photo of fascine installation below. We custom collect live stakes and other cuttings for each order and require at least seven days advance notice to harvest the material. The minimum live stake order quantity is 50 stakes. Large orders may require more advance notice and small orders may be done more quickly. Materials are priced by the foot, diameter, and species, so please provide complete specifications when placing your order or bid request. We would be happy to make recommendations on material specifications to match the needs of your project. 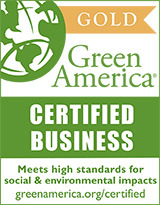 We typically provide live stakes with a standard range of ½ – 1½ inches diameter. Larger material or material that meets tighter specifications is available, and will result in an increase in price. Please be sure that the order confirmation you receive reflects any material specifications. For all confirmed orders, the customer agrees to pay for any and all material harvested. For all changed or cancelled orders, payment is due in full for any and all material already cut. Review Terms for live stakes and cuttings before placing an order. Our cuttings sites are mostly in Thurston County, but we can provide material from other regions in western Washington on request. The following species are commonly used in western Washington. Availability varies over time. Live stakes and cuttings may be used in a wide variety of habitats and applications: in wetlands, flood plains, marine bluffs, stream banks, lake shores, landslides, road slopes, and storm water detention ponds. 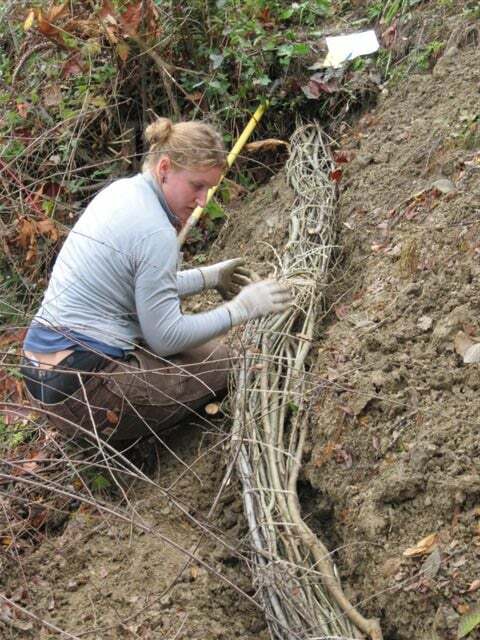 Cuttings are a mainstay for bioengineering techniques-techniques that incorporate live plant materials in engineering practices for stabilizing soil: live crib walls, brush mattresses, soil lifts, retaining walls, fascines, rip rap, and gabions. We provide complete consulting services for designing and constructing projects using live stakes and cuttings. Stand back and watch the sticks turn into trees!